New Totem Towers class begins May 1. Sign up now. When spring arrives, can our spring sale be far behind? 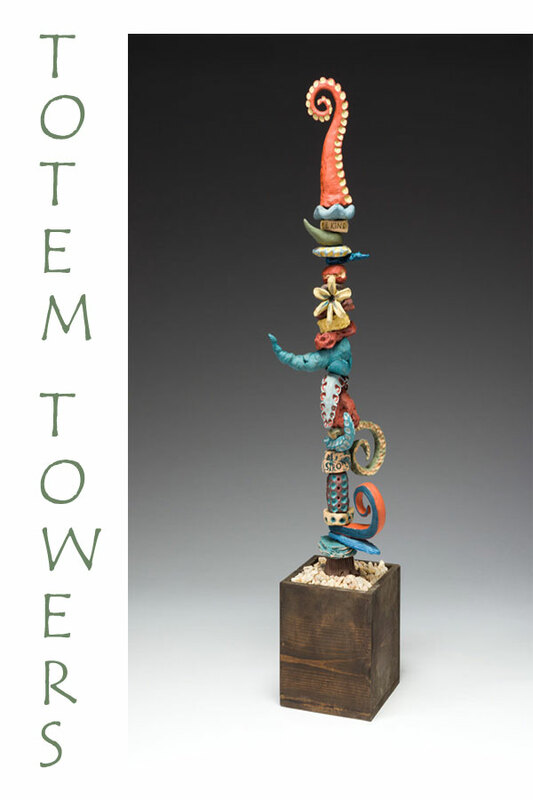 Watch your mail for full details about our spring sale.
. . . about Totem Towers, our newest class? To·tem /ˈtōtəm/ Noun : A natural object or animal believed by a particular society to have spiritual significance and adopted by it as an emblem. Personal totem : An object imbued by its owner with meaning and significance beyond its usefulness or aesthetic appeal. ﻿ Totem tower : A collection of totems having significance to its owner. This lively class will teach you how to create individual totems and combine them to make your own personal totem tower. Get complete details about the class and sign up here. Our spring classes get under way in days . Sign up now to secure your place. Tues, Apr 16-Jun 18, 6:30-9:00 pm, with Kay Yourist. Sun, Apr 7-May 19, 1:30-3:30 pm, with David Timm. 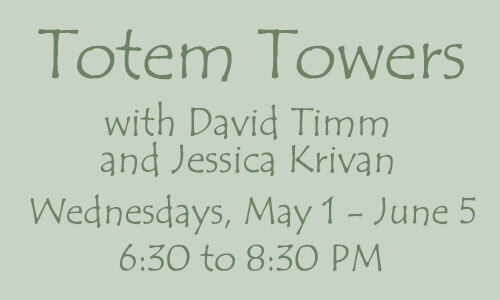 Wed, May 1-June 5, 6:30-8:30 pm, with David Timm and Jessica Krivan. 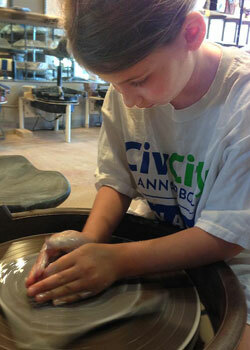 What would you see if you dropped in on one of our Kids' Clay Morning classes? Young hands busy with clay and young faces intent on what they are creating. Here, a girl sticking her tongue out slightly as she molds her clay. There, a boy blowing his hair from his forehead as he tries the pottery wheel. Everywhere, delighted laughter and talk. For children ages 7 to 10. Register here. Our bisque shelves . . .
. . . are overflowing with work by our impressively productive students and resident artists. If you have bisqueware from March on our shelves, please come glaze it for firing or collect it and take it home. To free our shelves for new bisqueware, we must discard any unclaimed bisqueware remaining after April 30 . Ewww. Nothing's nastier than a grungy sponge. To clean studio sponges , be sure to rinse them twice : first in the tub in the sink to remove the accumulated clay, slurry, slip, or glaze and second in clean water from the faucet. Help keep our studio clean, healthy, and free of dried clay. 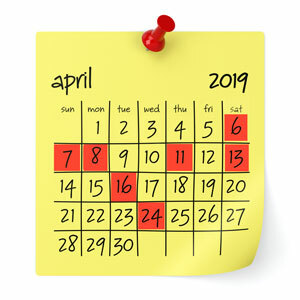 Here's our tentative schedule for the April gas kiln firing. Start getting your work glazed and ready to go! 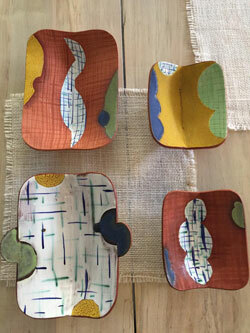 Keep in mind that this schedule could change depending on the supply of pieces available for firing. Be sure to check with the studio for the latest schedule. In the upcoming Tool Time, on Saturday, April 20, at 3:30 pm , Kay will demonstrate how to throw open casserole forms, one with a bottom and one without, that can then be shaped as you wish. Drop by the studio to see this demonstration, which is free and open to the public . Meanwhile, if you have topics you'd like Kay to cover in her free Tool Time demonstrations, please let us know . We're interested in hearing from you. Q. My pots are so wobbly they're making me dizzy. How can I de-wobble them? A . 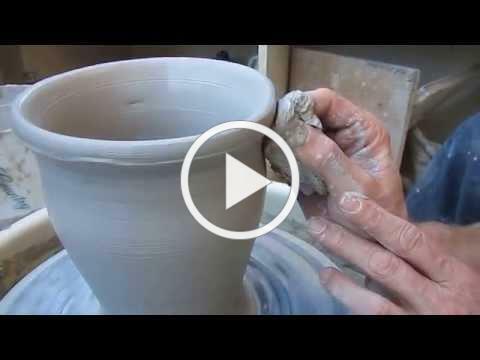 Take a look at this video from potter and educator Jerry Hendershot , who explains possible causes of wobbly pots and demonstrates how to fix them. You can see photos of Hendershot's work here . 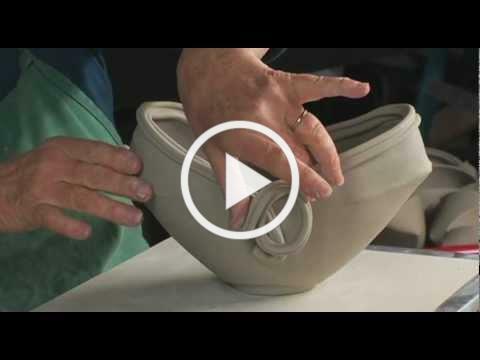 In this popular video (163,671 views since posting), potter Peggy Reichert demonstrates two creative ways to alter freshly thrown ceramic bowls to make a boat-shaped form and what Reichert calls an origami form. Hand builders, Reichert's methods could work for you, too.